Spirito does not offer any booking services that we know. You can always contact them to check. 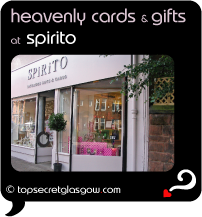 Spirito is a greetings card shop - and much more. Sitting quietly along flat-filled Crow Road, locals in the know have returned so much that it happily doubled in size soon after opening. Cards and gifts are unique here. Whenever you have a special event to celebrate, and a tricky gift to buy, they can help. Really good for engagement and wedding gifts, it also has a good range of jewellery and ornaments with quality as high as the hand made cards they stock. Great news! Finding this page means you can now join our VIP list for Spirito. Grab your very own web page all about Spirito. Do you have a special story about Spirito? A funny experience? A grand occasion? A funky photo? A personal tip? A top secret?